This is sort of like the dead elephant in the room right? North Korea's leadership is committing systematic and appalling human rights abuses against its own citizens on a scale unparalleled in the modern world, crimes against humanity with strong resemblances to those committed by the Nazis, a United Nations inquiry has concluded. The UN's commission on human rights in North Korea, which gathered evidence for almost a year, including often harrowing testimony at public hearings worldwide, said there was compelling evidence of torture, execution and arbitrary imprisonment, deliberate starvation and an almost complete lack of free thought and belief. The chair of the three-strong panel set up by the UN commissioner on human rights has personally written to North Korea's leader, Kim Jong-un, to warn that he could face trial at the international criminal court (ICC) for his personal culpability as head of state and leader of the military. "The commission wishes to draw your attention that it will therefore recommend that the United Nations refer the situation in the Democratic People's Republic of Korea [the formal name for North Korea] to the international criminal court to render accountable all those, including possibly yourself, who may be responsible for the crimes against humanity," Michael Kirby, an Australian retired judge, wrote to Kim. Holding up a copy of the report, Kirby said other nations could not say of North Korea, as happened with the Nazis, that they did not know the extent of the crimes: "Now the international community does know. There will be no excusing a failure of action because we didn't know. It's too long now. The suffering and the tears of the people of North Korea demand action." Asked how many North Korean leaders and officials could ultimately be held responsible, Kirby said it could reach the hundreds. The inquiry heard public evidence in Seoul, Tokyo, London and Washington. Among more than 80 witnesses, along with 240 people who gave confidential interviews to avoid reprisals against relatives in North Korea, were escapers from the country's feared prison camps, including one who reported seeing a female prisoner forced to drown her newborn baby because it was presumed to have a Chinese father. The near-400-page main report concludes there is overwhelming evidence that crimes against humanity have been, and are still being, committed within the hermetic nation. It says: "These are not mere excesses of the state: they are essential components of a political system that has moved far from the ideals on which it claims to be founded. The gravity, scale and nature of these violations reveal a state that does not have any parallel in the contemporary world." The report concludes that many of the crimes against humanity stem directly from state policies in a country which, since it was formed from the division of Korea, has been run on a highly individual variant of Stalinist-based self-reliance and centralised dynastic rule. The inquiry found "an almost complete denial of the right to freedom of thought, conscience and religion", with citizens brought into an all-encompassing system of indoctrination from childhood. Perhaps the most chilling section describes the vast network of secret prison camps, known as kwanliso, where hundreds of thousands of North Koreans are believed to have died through starvation, execution or other means. It is estimated that between 80,000 and 120,000 political prisoners are still held, in many cases secretly. In fact, the kyo hwa-so described by â€œCase Study 29â€� are far from the worst prisons in North Korea. Koreans sentenced for political crimes, which the government takes more seriously, can be sent to the far harsher kwan li-so, â€œreeducation camps.â€� Entire families, up to three generations, can be sentenced to these camps if one family member is accused of treason. This is meant to ensure the complete eradication of any treasonous elements in the state. Hawk estimates that currently there are 150,000 to 200,000 prisoners throughout North Korea in the kwan li-so alone. There is no right to a fair trial in North Korea, and many are sent to prison camps without knowing the specific crimes for which they were sentenced. The actual crime may be mundane; for example, â€œThe Hidden Gulagâ€� mentions a woman sent to a prison camp for singing a South Korean song. The worst of the â€œreeducation campsâ€� belong in another class altogether. Their goal is not to reeducate, but to extract labour until death. The largest of these is Camp 22, with an estimated 50,000 inmates. Forced abortion, once common across the entire North Korean prison system, has reportedly decreased over the last decade. However, the very few eyewitness reports from Camp 22 include stories of infanticide, in which guards stomp on newbornsâ€™ heads to kill them. Worse, North Korea experiments with chemical weapons at Camp 22, using prisoners as test subjects. In a report from the BBCâ€™s â€œThis World,â€� a defected security officer known only by the pseudonym Kwon Hyuk recalled one such experiment. The remarkable satellite image, left, shows the stark contrast between North and South Korea which glows bright next to its neighbour. North Korea - which is ruled by supreme leader Kim Jong-un - is almost completely black appearing to show a distinct lack of power or energy supply. However the rest of the country - which has a population of 24 million - is pitch black looking almost like a sea between South Korea and China, right. 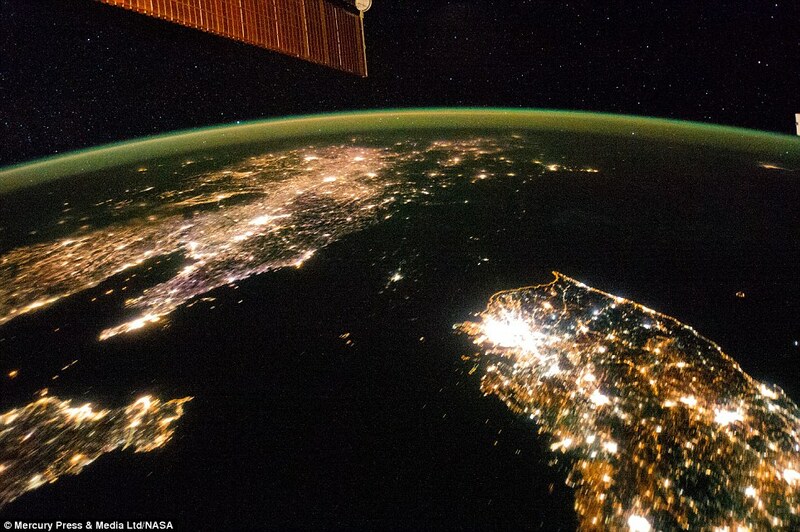 The NASA Earth Observatory website commented on the photograph: 'North Korea is almost completely dark compared to neighbouring South Korea and China. North Korea - which is ruled by supreme leader Kim Jong-un - is almost completely black appearing to show a distinct lack of power or energy supply. The only exception is the country's capital Pyongyang to the south east of the nation which is illuminated by city lights.However the rest of the country - which has a population of 24 million - is pitch black looking almost like a sea between South Korea and China. Geneva (AFP) - Ahn Myong-Chol witnessed many horrors as a North Korean prison camp guard, but few haunt him like the image of guard dogs attacking school children and tearing them to pieces. "There were three dogs and they killed five children," the 45-year-old told AFP through a translator. "They killed three of the children right away. The two other children were barely breathing and the guards buried them alive," he said, speaking on the sidelines of a Geneva conference for human rights activists. 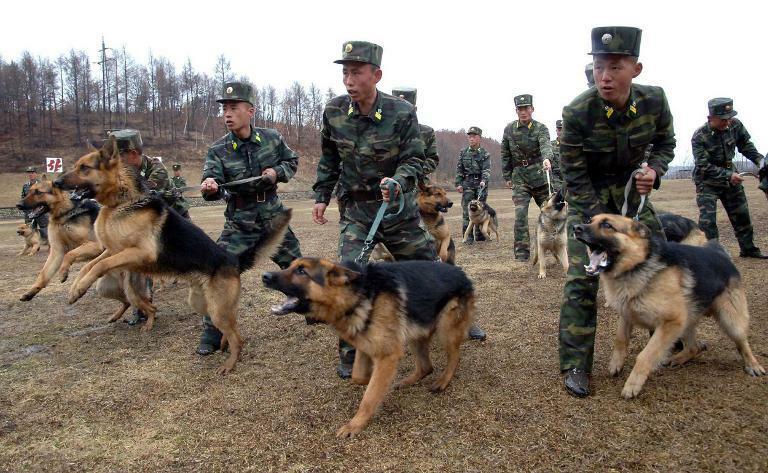 The next day, instead of putting down the murderous dogs, the guards pet them and fed them special food "as some kind of award," he added with disgust. "People in the camps are not treated as human beings... They are like flies that can be crushed," said Ahn, his sad eyes framed by steel-rimmed glasses. LONDON â€” After years of North Korea thumbing its nose at the international community, on Friday Defense Secretary James Mattis appeared to signal enough was enough. Kim has pledged to develop weapons capable of striking the U.S. and its allies. Three of the country's nuclear tests were completed under his rule and he conducted more missile tests over the past four years than in the rest of the country's history. Trump could try to levy more sanctions on the country, although these have not stopped previous tests and Tillerson appeared to dismiss this approach earlier this month. I think that Leader of N. Korea Kim Jon Un learned Serbian lessons about Trials for war crimes in Hague. Sanctions only hurt the little people of North Korea, more. They are already compromised and subjegated, unable to rise up. Kim jung un will be able, along with his entourage, to obtain *anything* they want.